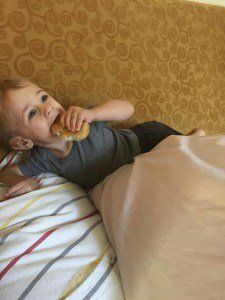 Despite all the money I spend on groceries and all the energy I pour into making meals, my kids mostly survive on crappy (although often organic!) snack foods. Their constant snacking makes it so that they are never hungry enough to sit down and eat a meal, yet starvation seems to strike suddenly in the most inopportune times. The lack of structure means I hardly ever know if they’ve eaten enough, which perpetuates the snacking cycle. Of course, I start them off with a good breakfast, but with assurance they’ll be able to eat again in a half hour, they are easily distracted. All my cooking efforts are in vain. So much food gets wasted, especially the healthy stuff. The mess and work is constant. As soon as I get one mess cleaned up, they’re already requesting something else. I’m sick of it. Sick of the perpetual slaving, serving, and wasting just to end up still worried about their intake and health. 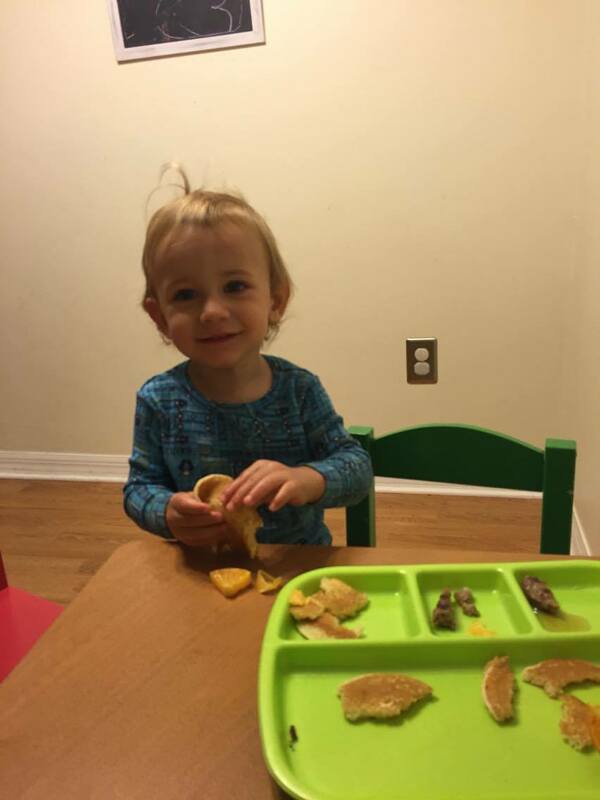 I decided to implement Ellen Satter’s advice on how to feed children. She’s a family therapist and registered dietician nutrionist who is internationally recognized as an eating and feeding authority. You can read about her philosophies and guidelines here. 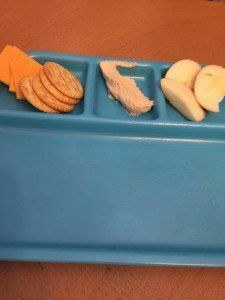 Meals and snacks are at set times during the day and we sit at the table for them (unless we are out during a snack time, then we improvised). No beverages, other than water, are allowed in between these times. I sat down and ate with them (mostly). When they left the table, the meal was over. I made it clear they would not be allowed to eat until the next snack or meal time. I offered a variety of foods. Maybe there were some new ones, but always options that I knew they liked. I didn’t remark on how much they ate nor did I ask them to eat more of this or that. I served them, and then let them choose how much of something they wanted. Ellen Satter says the parent decides what, where, and when to eat, and the child decides how much. 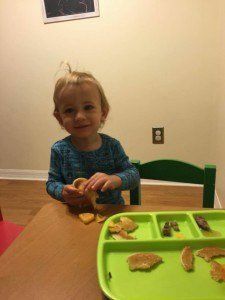 The night before I started, I told my 4-year-old that I’m doing an experiment to see what happens when we only eat our meals at the table at certain times. I told him that once he walks away from the table, meal time is over, and that he won’t be given anything else until the next snack time. I told him that in between meal times he will only be allowed to have water. We basically ate 4 small meals during the day and a bedtime snack after bath. The times were roughly 8:30 am, 11:30 am, 2:30 pm, 5:30 pm, and 7:00 pm. These times weren’t exact, just a guide. The first day was amazing, and I enjoyed the added structure. 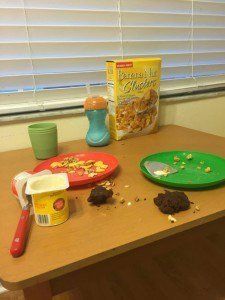 Before implementing these mealtime rules, I tended to leave food out in case they wandered back around for another bite. But now meals had clear end times and messes were cleaned up promptly. I told my 4-year-old I’d deny his requests for a snack until the next time, so he made sure to eat enough. The meals I served were mostly wholesome and balanced. I didn’t just sprinkle some cheerios around or throw them a few biscuits. I made sure to offer fruits, vegetables, protein, and healthy fats at most meals. This didn’t make more work for me because I planned for it, and cooked all I needed at once. I enjoyed the quality time of sitting with them to eat, and made sure to keep distractions (like my phone) away from the table. I was generally in a better mood because I wasn’t annoyed by constantly serving and cleaning just to be whined at 20 minutes later about hunger. I also felt more confident. 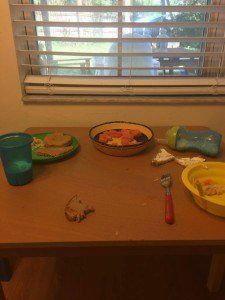 I was proud that my kids were eating well and that I was being present with them. Mom of the Year award, please! With my new plan, making a grocery list was easier and I had a better idea of what I would serve at each meal. I made a list and vowed to not go back to the store for a week’s time. (What a novel idea! ) Trader Joe’s gives out lollipops to kids, and it’s a crucial part of our shopping trip, so although it certainly wasn’t a scheduled snack, we indulged. There’s some wiggle room for this sort of occasion, right? On this day my 4-year-old was distracted and playful at meal times. He kept whining and wanting to snack. I denied his request for crackers, but I did let him munch on some bell peppers while I finished getting lunch ready. 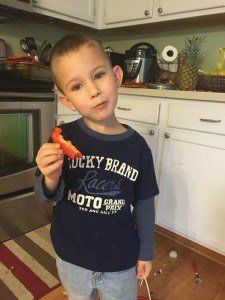 My son would have never eaten raw bell peppers before but because he was genuinely hungry he was willing to try new things. He even decided he liked them, so I sliced him another! 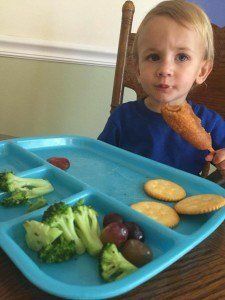 Feeding my children in this way makes me plan meals out better, so while I prepared lunch, I went ahead and cooked dinner, too! Feeling like a boss…. My husband got home early and wanted to go out together for ice cream. I had to work my mind around schedules being a good framework to follow but not becoming too rigid about it. Sure consistency is important, but so are ice cream dates. There must be room for flexibility. Oh yeah, dear husband also wanted to eat in the living room. It’s not something we usually do, but he was extra tired so I obliged and pulled the kid’s table into the living room. I’d call it a win-win. Or perhaps a loop hole. I noticed that whenever my 15-month-old fussed, I was very tempted to hand him a cracker. I had to find new ways to comfort him, or just accept that he was going to fuss and I wasn’t going to pacify him with goldfish. It’s enticing to eat our feelings away, but maybe not the best habit to teach. Oh my gosh, I cleaned my car out on the first day of this experiment, and it’s still clean! It’s not covered with wrappers, crumbs, and stinking of rot. If someone needed a ride, I wouldn’t even feel embarrassed by the state of my vehicle. The kids have adjusted to the new schedule, and we all have a better idea of what to expect. I’m definitely going to continue feeding my family in this way. They ate a great variety of foods, and our time at the table together was actually enjoyable. I didn’t spend it nagging, and they didn’t spend it whining. They arrived to the table hungry, and they ate. My house is cleaner, my kids are happier, and I feel way more in control. My children have less meltdowns because they are better nourished. And I have fewer meltdowns because there are fewer demands on me. Amanda has a background in education and child development, but now spends most of her time roaming her Orlando neighborhood with her two barefoot boys. She mostly writes about parenting, marriage, and women's issues. Her work has appeared in The Washington Post, Huffington Post, Scary Mommy, Your Tango, and more. Find her on Facebook at https://www.facebook.com/stayathomepanda/.